The charming Hungarian capital is known as the ‘Queen of the Danube’ and the ‘Paris of the East’. The city straddles both sides of the River Danube and comprises of what were originally two distinct cities Buda and Pest. Of the two Buda is the older section located on the left bank of the River Danube. Buda possess an old world charm with its cobbled streets, medieval neo classical architecture set amongst gentle hills. Pest located on the east bank is the commercial heart of the city with its fancy shopping districts and wide boulevards built in an efficient grid like manner on the flatter plain. The city along with other Eastern European cities of Krakow and Prague in recent times has become a tourist favorite with millions visiting the city every year. The history of the city can be traced back to the age of the Romans who laid the foundations of the city as early as 89 AD. The Romans were followed by the Bolgars of Bulgaria and then the Magyars who established the Kingdom of Hungary. The Mongols then tried to consolidate themselves here but the power struggles with the Magyars saw them relinquish control to the Magyars once again. The Magyars were succeeded by the Ottomans who reigned here until 1686 when they were vanquished by the Austrian Hapsburgs. 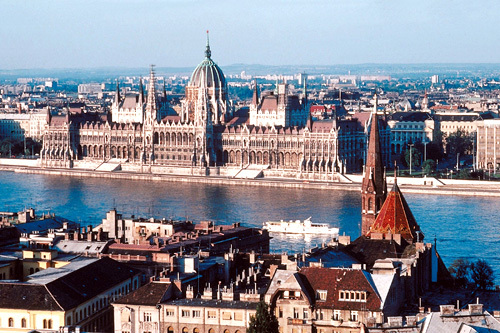 The rule of the Hapsburgs saw Budapest being established as the capital of Hungary. Hungary suffered greatly in the two World Wars and at the end of the Second World War the communists seized control of Hungary. In 1956 there was a bloody revolution against the Red Army in which 2500 Hungarians died and 20,000 civilians were injured. The communists then slowly introduced market reforms as early as in1968 which paved the way for the end of the communist rule in 1989. In 1990 the Budapest stock exchange opened and Hungary finally left the Warsaw Pact. Budapest enjoys nearly 2000 hours of sunshine and the seasons of spring and autumn are the ideal times to visit this beautiful city. From April to September one can expect to enjoy nearly ten hours of sunshine. Summers in Budapest are warm with the mercury climbing to nearly 21°C (70°F) and higher in August which is generally the hottest month of the year. Rains come to the city in the month of November and winter sets in towards mid-December. January is the coldest month with temperatures averaging around -2°C (28°F). Hungarian (Magyar) which is distantly related to Finnish and Estonian is the official language spoken in Budapest. The German language is also widely spoken and English is spoken and understood in areas where there is a concentration of tourists. The official currency of Hungary is the Hungarian Forint. The country has joined the European community hence prices are quoted in Euros as well as the Hungarian Forint which continues to be used. Credit cards are widely accepted as is the use of ATMS. Budapest is served by Ferihegy International Airport which comprises two terminals. Terminal 1 is used by the several low cost carriers such as Easy Jet, Wizz Air etc which provide connections between Budapest and several other European cities. Ferihegy International is also the hub for the national carrier Malév. Malév which uses Terminal 2 provides a link between Budapest and North America through a code share with Delta. Air links exist between Budapest and countries in the Middle East, Asia and North America. The best way into the city center is by the Airport Minibus service. The service operated by the Budapest Airport Authority operates at a frequency of 15 minutes all throughout the day. It takes one directly to one’s destination in the city after making stops to drop off other passengers. There is even a return service available for which one has to call the minibus number 1/296 8555 at least twenty four hours in advance. The service is available from both the airport terminals at a price of 2300 HUF per person and the trip into the city usually takes half an hour. In late 2006 a taxi company called Zóna Taxi has won the contract for the airport pickups which were previously operated by the overpriced Airport Taxi. The fare to the city is about 4500 HUF. One can also use the regular bus service from Terminal 1 into the city by using the bus which operates on route 93. The last stop on this bus is Kobánya-Kispest and then one has to switch to the Metro to the city of Pest. The tickets for this journey which takes about an hour are available at the bus stop or the newspaper kiosk at the airport. Another bus route which provides a link from the airport to the city from Terminal 2 this is the bus route 200. Budapest is well connected by train to other European cities. Most international trains arrive and depart from the Keleti Station (Eastern Railway station) It is located in Pest in Baross tér. The Red line of the metro serves this station as due numerous bus, tram and trolley bus services. Daily direct train links exist to European countries such as Austria, Germany, Greece; Turkey etc Train links from Budapest provide an access point to the Balkans and Russia. A few international trains arrive at the Nyugati station (Western Railway station). The Blue line of the Metro serves this station. At the Déli station (Southern Railway station) which is in central Buda no international trains arrive and depart but it serves the regional train services. The entire train system is operated by Hungarian State Railways (MÁV). Regional services are provided by a variety of trains the most expensive of which are the trains which operate on the Intercity service but these trains are the fastest and the cleanest. Budapest’s train stations are in need of a major overhaul if they are to meet the standards of Western train stations. MÁV operates a minibus service which provides a connection to the airport from any of these three train stations. This service has a two person minimum requirement. This mode of travel is not that popular any more due to the advent of the low cost carriers.Direct bus links exist between Budapest and other European countries such as Belgium, Bulgaria etc. There are daily bus services to Slovakia and Austria. The international bus services are operated by Eurolines. The city’s most modern bus terminal is the newly opened Népliget Bus Station from which international bus services and buses to Western Hungary operate. Twenty eight bus companies who operate under a single association called Volán Association and run the domestic bus service of Hungary providing links between Budapest and other Hungarian cities. The domestic bus stations in Budapest are Árpád hid bus station, Stadion Bus Station and Etele tér Bus station. A hydrofoil service operated by the ferry company Mahart operates on the Danube linking Budapest to Vienna and Bratislava daily in the months of April to November. It also operates day sight seeing cruises on the Danube for visitors. The city of Budapest is divided for administrative purposes into 23 districts which are numbered in Roman numerals. The three main districts are Buda and Pest and the historic district of Castle Hill which is actually district 1 of Buda and includes most of the tourist sites including the Castle. The city is well served by a systematic, well run, orderly and extensive public transport system. The only spoke in the wheel of this well oiled machine is that most transport stops operating at 11.30 pm after which a limited tram(4 routes) and bus service( 17 routes) bears the load of nighttime travelers until 5am. The metro consists of only three lines but is clean and safe and it covers most of the sites on the tourist trail. Buses complement the Metro service by providing connections to areas not served by the Metro especially around Buda. Trams are a useful mode of transport to traverse areas around the Great Boulevard or the embankment. Trolley buses which are electric buses provide another option for transport in Pest. HÉV is the over ground train service which links the city center to the suburbs. There are four HÉV lines with the Szentendre line having the most importance for tourists. The Castle district can be accessed on foot as well as by Cog wheel railway or funicular. The funicular connects Buda’s Clark Ádám tér to Dísz tér just outside Buda Castle. The public transport can be accessed using tickets which can be pre purchased and then validated. This is a trifle complicated for tourists who should stick with day or multi day passes which are economical and user friendly. The Budapest Card is a card which combines three days travel with discounts to attractions but it does not prove very economical and hence it is not recommended for tourists. The Taxi drivers of Budapest are known for being unscrupulous; tourist should not do business with these touts who usually hang around Railway stations in umarked cars. Some of the reputable taxi companies are Citytaxi, Fo Taxi and Tele 5 Taxi.